Hali Bernstein Saylor/Boulder City Review Patrick Gubbins, deputy superintendent of Lake Mead National Recreation Area, and Lynn Neufeld, Alan Bible Visitor Center lead ranger, serve cake on Friday to mark the National Park Service's 101st birthday. The celebration also include educational exhibits, a chance to create an animal figurine out of a stick and the opportunity to write a haiku. 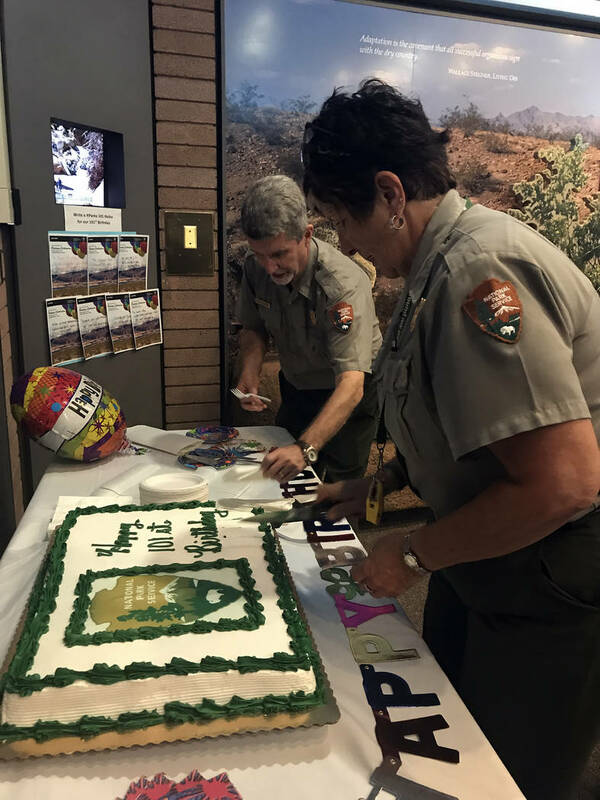 Patrick Gubbins, deputy superintendent of Lake Mead National Recreation Area, and Lynn Neufeld, Alan Bible Visitor Center lead ranger, serve cake Friday to mark the National Park Service’s 101st birthday. The celebration also includes educational exhibits, a chance to create an animal figurine out of a stick and the opportunity to write a haiku.